In the urban conditions, most dog owners face a problem of insufficient walking with the pet. As a result, dogs suffer from lack of physical and emotional activity, and pets have problems with obesity and chronic diseases. Often the dog begins to suffer neurosis, which is manifested in the fact that it can spoil the furniture or furnishings while the owner is away from home, or even may be aggressive towards both owner’s family and the owner himself. PULLER was developed by professional cynologysts as an innovative training shell for dogs. 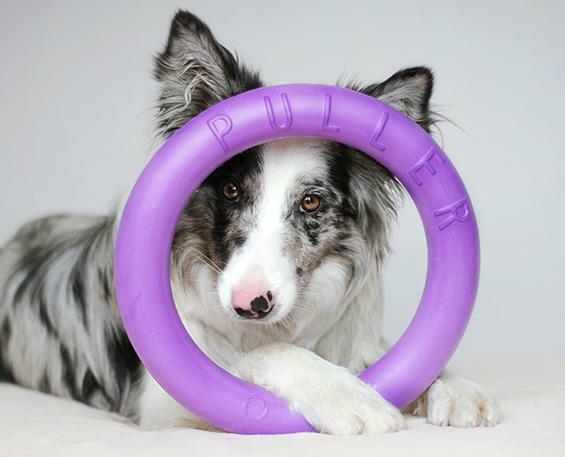 A special set of two purple PULLER rings and a set of exercises with it will provide daily interactive training for dogs and all the necessary physical activities, so the dog owner doesn’t have to spend a lot of time on walking. Just a few exercises for 20 minutes will give the dog the training and activities of 5 miles of running! 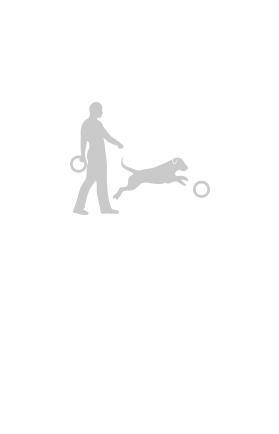 During the Fetching, a particularly most of activities comes on neck and shoulder when the dog tries to catch a ring in the air or rolling on the ground. As this exercise includes not only jumps, but also catching of a ring with teeth and interception from one ring to another, the neck and shoulders receive full-fledged and maximum of possible activities. The dog gets the maximum activities, especially if tosses by neck during the pulling. This develops strength and endurance, and also allows splash out the accumulated overpowered energy. All neck muscles, even those that are not involved in other exercises, work during the hanging. For this exercise, you need to make sure that the dog is ready and in good physical shape. Varying the force and range of the throw, you can change the speed of the run and thus the degree of pressure on back muscles. Jumping is a great muscle brace. In this exercise, the lumbar muscles are particularly effective. Swimming is the only practice we recommend on a hot summer day. Swimming will also be ideal for both training and physiotherapy. When the dog is pulling PULLER ring, the main activity goes to the top of the back and the shoulder girdle. Because of the dynamic nature of this exercise, the muscles get enough of heavy activity. 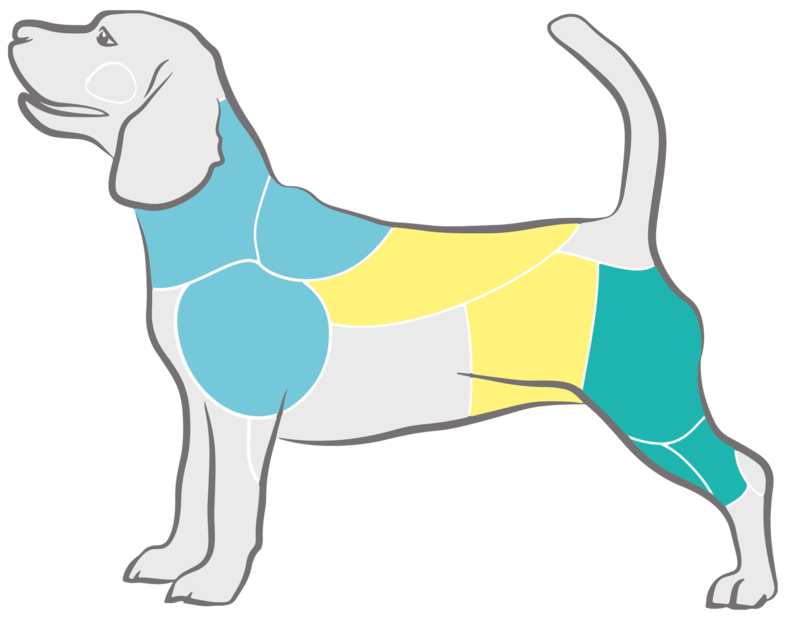 During this exercise, the dog develops enough speed in a short period of time, and then it has to stop and change the direction of the race. This gives an intense hip and shoulder activities. To carry out the jump, the dog takes a strong jolt from the ground. It's particularly good thing to develop the power of thigh muscles. Changing the directions and rate of jumps – the intensity of activity and the involved groups of muscles changes. Swimming gives the intensive and at the same time sparing activity of muscles of hips and the shoulder girdle, without wearing out joints. Swimming is particularly recommended in the case of recovery treatment after injury. PULLER two-ring training alternately allows you to maintain a high rate of training and give you the necessary load. Exchanging of PULLER rings keeps the dog in constant interest in his classes. Jumps with PULLER give activities on all body system of a dog and a cardiac muscle, develop coordination. 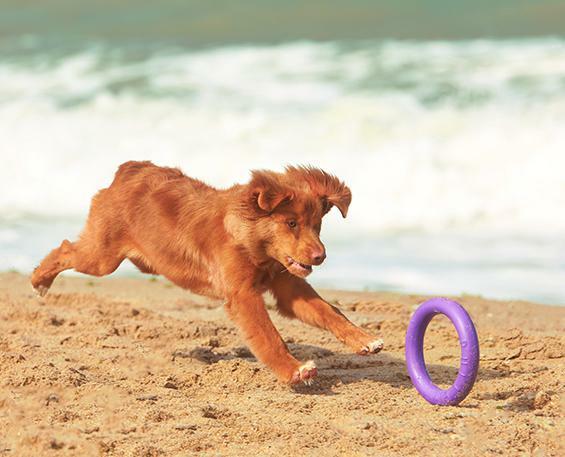 In doing so, changing the length of the exercise, the speed and the height of the jump, you can change the load and develop endurance in your pet. An exercise that helps relieve the stress of a dog and charge it to the positive. It’s also a good workout before jumping, or just an encouragement during practice. One of the most important exercises, which is not only to load the whole dog’s hull, but also to do it in a benign therapeutic mode. Recommended for dogs of any age. Why PULLER is called the" training tool"? Isn’t that just a dog toy? The projectile is a specialized-destination device used in a sports activity. PULLER is a special device that Dog Puller competitions are organized. The International Federation of Dog PULLER (IFDP) was founded and registered in 2012 and includes activists from around the world. At that time, there was the new Sport Championship in history. In turn, these competitions are intended to be included in the Olympic Games for dogs that growing popularity throughout the world. So between a typical toy and PULLER there is huge difference, and above all, in their purpose. Why are there TWO rings in the set? Is one of them is the spare? PULLER for a long time was carefully developed by cynologists and recommended for use as a set of two rings. The second isn’t the spare. 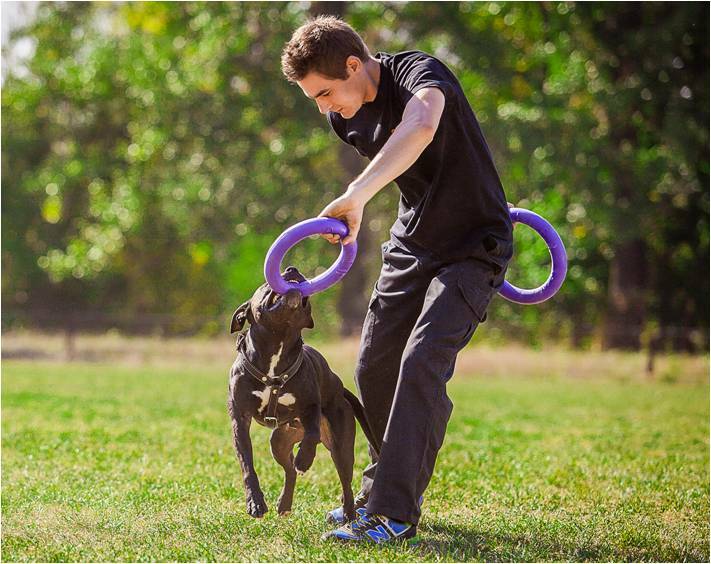 Working with two rings at the same time, the dog and its owner maintain constant contact during the class. The dog is accustomed to switch quickly from one object to another (from one task to another) at a high rate of work. This in turn provides the foundation for any subsequent training programs. 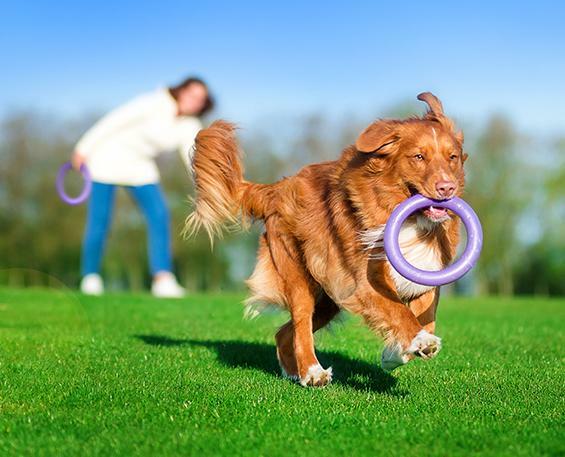 By using both rings at the same time, you can increase the efficiency of your practice by keeping your dog’s interest in it all the time. If you do “save” or decide to simplify your classes and use only one ring, you will not get the effect of training. 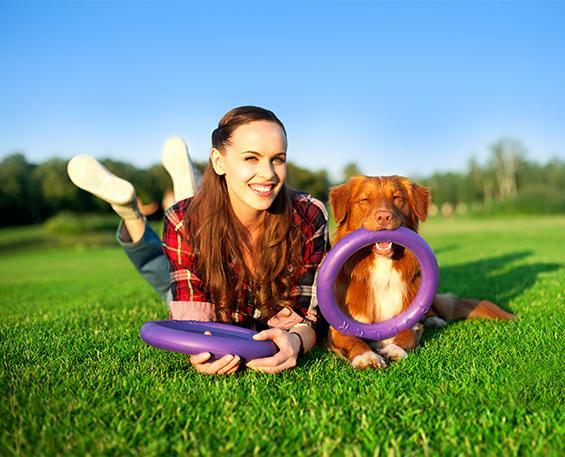 A complete set of training and development of a dog is possible only with the use of a set of two rings. 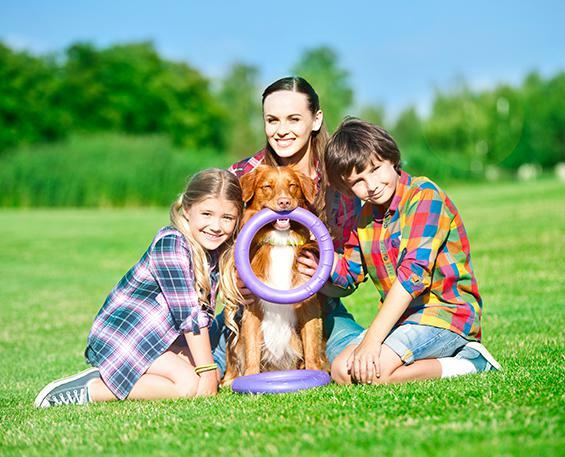 Do you know that each owner can teach a dog to jump with PULLER? Or she’s got no interest! The dog doesn’t have to jump high. So, first we teach the dog to pull. Further, reducing time for pulling of PULLER and increasing changeover frequency from one shell by another, it’s possible easily to teach your dog to jump and capture PULLER. It’s necessary to continue to develop hops in the light of the obligatory isolation of two paws. How do I teach the dog to swim with PULLER? 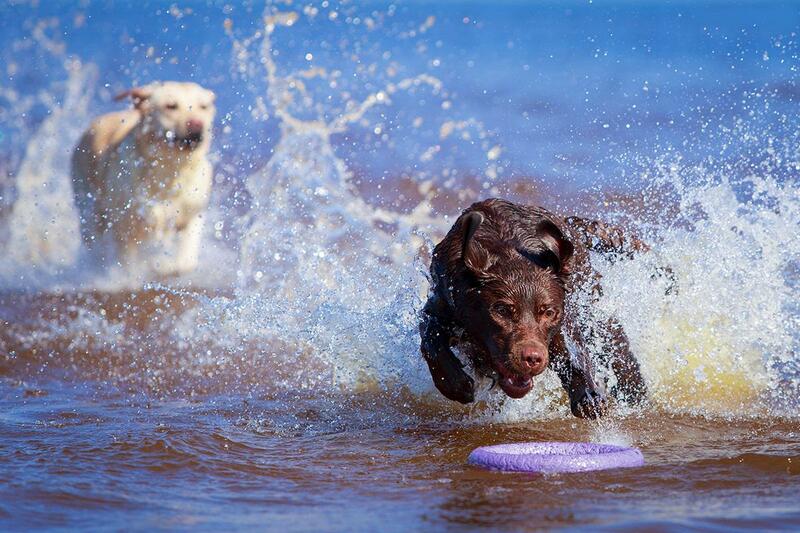 If your dog is happy to work with PULLER, it’ll be enough to teach him how to swim easily. First, start games with PULLER on the shore. It’s desirable for the shore of the pond to be used. Continue games already at a water edge that it is imperceptible for itself the dog in the course of catching of rings of PULLER ran already on water. Then it’s possible to organize jumps for PULLER in the same place in shallow water, again to play with a dog pulling. And thus, playing and entraining a dog, it’s possible to accustom her to water. When you reached the stage of fearlessly the dog’s entrance into the water, go deeper, so that the dog should already take his paws off and swim. Praise the dog for every action it has performed. And even if there’s something wrong today, it’s going to be tomorrow! Finish your workouts always on the positive. Only after the dog is free. To swim in the shallow water, you can start throwing the PULLER on the little distance from the shore. But don’t rush to throw the projectile right away. The dog can be frightened of depth, and PULLER may have to get to you. 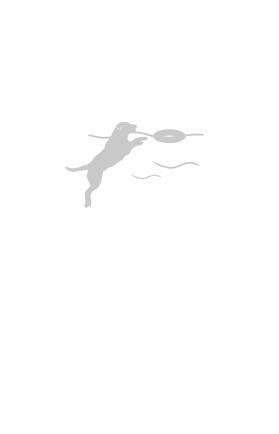 PULLER is a great motivator for your dog everywhere, and the training on the water will be for him, and for you, the most fun and efficient pastime. Development of disobedience of the dog? 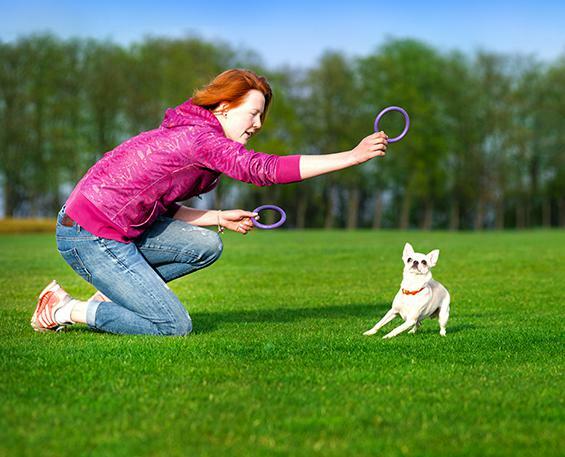 Pulling exercises-do they not provoke the development of disobedience of the dog? Don’t deprive the dog of the pleasure of pulling the PULLER ring, because the pulling is the dog’s basic instinct to extract. It’s also the pleasure for a dog to show his strength and endurance. If the master is working properly, this lesson becomes even more interesting because the power of resistance during pulling, is increasing and getting smaller, and the dog’s got a passion. And, of course, during the Pulling, the dog works active with his jaw, which gets the pleasure, and the specially developed material of PULLER helps to it.